EZ-Gro Boron (B) 8% 9-0-0 is a versatile plant nutrient supplement powder, which exploits amino acid chelation to enhance its bioavailability boron. Boron is an essential macronutrient required for proper reproductive and vegetative growth as well as development of most plants. It is involved in the development and maintenance of many structural components of cells, and therefore many growth deficiencies are seen without adequate levels. 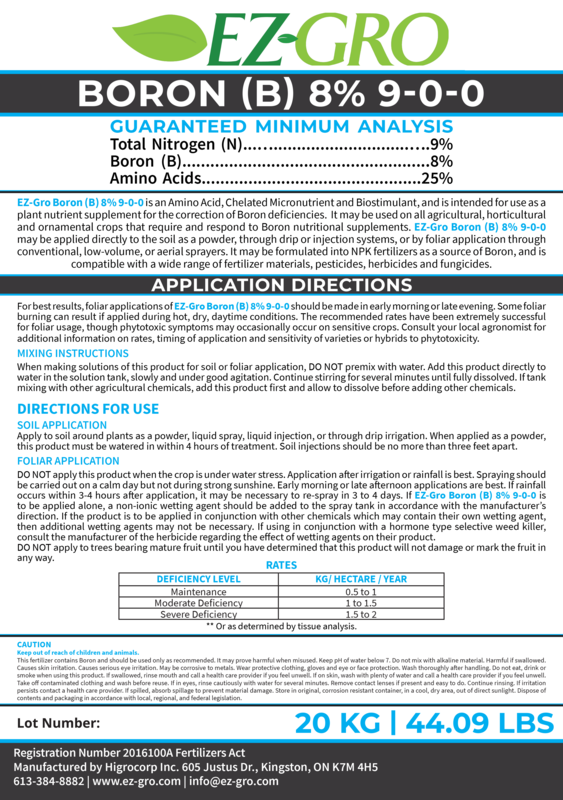 Add EZ-Gro Boron (B) 8% 9-0-0 to your current fertilizer regimen to fix boron deficiencies and improve growth, yield and quality of your plants.